The Doctors. The missionary doctors and medical staff of SIM’s Galmi Hospital in Niger do some amazing work. After almost 50 years of striving to provide the best health care possible, Galmi Hospital is considered the top medical and surgical hospital in this country of 10 million people. They do all this despite working in a facility where the main hospital building is almost 50 year old. Even the best conceived and best built 50 year old hospitals in North America are considered tired and outdated. In the harsh conditions bordering the Sahara Desert with its sandstorms and daily temperatures hovering in the mid-40’s Celsius, no building stands a chance. Add in narrow corridors, dim lighting, stale air and resulting smells that assault the senses and the great work done here becomes all the more remarkable. The Hospital. 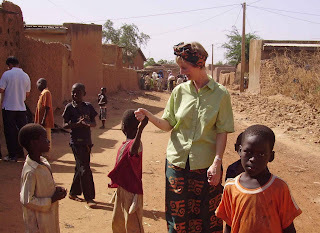 Niger is one of the poorest nations on earth and we saw it first hand. I would reflect later that it was one of the most emotionally difficult trips I have ever been a part of. The poverty was staggering and the needs beyond comprehension. However, even as we observed the challenging conditions, including the over-whelming number of out-patients (up to 300 per day) and witnessed the crushing need and palpable despair, something else was slowly being revealed. After arriving on Saturday evening we had first met the missionary doctors, administrators and their families on Sunday during a potluck lunch but on Monday we saw many of them in action in and around the hospital. Rather than being repulsed, as we initially were, the doctors moved easily in and among the people. Holding hands, touching arms, speaking softly: we saw love in action that moved us deeply. 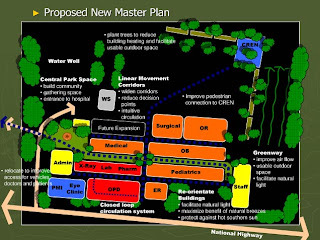 For the remainder of the week as we worked to create redevelopment plans for the hospital and interacted with the local population we faced a similar challenge: living out God’s love with grace and sensitivity while dealing with our task at hand with professionalism, efficiency and integrity. The Team. We began with our survey crew documenting the property boundaries and all existing site features while others hand-measured all the existing buildings. We investigated local building materials and construction practices. We met with administrators, doctors and reps from the national staff. We walked every inch of the property to understand its network of water and power systems and dug holes to test the soils: we were building the foundation for proposing a comprehensive redevelopment strategy. But during the work week we also set aside time to pray together, study God’s Word, go to local church services, visit the market, play with children and pray with patients. Some of these precious moments brought smiles, some brought tears while others brought both. Each night the last lights were not turned off and our laptop screens did not go dim until the early morning hours. The Results. Saturday morning was our Final Presentation to all missionary staff both administrative and medical. We explained how a redeveloped facility would have more natural light, catch prevailing winds for natural ventilation, repel the hot sun and have spacious corridors. We talked about how patients would have access to fresh air and a place to sit in shade outside their rooms. We assured them that even though the redevelopment would take several design and construction phases, eMi promised to return as often as needed and be the common thread to re-tune the master plan if needed and conduct detailed design for each subsequent new building. Our presentation was met with hope and optimism. It will always be the doctors, the medical staff and the resident evangelists who will foster both temporary and lasting change in the lives of the patients. However, if our new facility creates a better work environment for the doctors, medical and support staff and enables a more comfortable experience for patients, than our efforts will be called a success. Project Photos. A new set of photos has been uploaded to my Photo Gallery for this project, so click here (Photo Gallery) and see the Galmi Hospital set with a slideshow. If you want to read a description of each photo, you can also take a look at the photos in Details (Photo Details). Check it out and see what your support and encouragement has produced in the work of this team. "Thank you" to all our prayer and financial supporters for making projects such as this a reality.